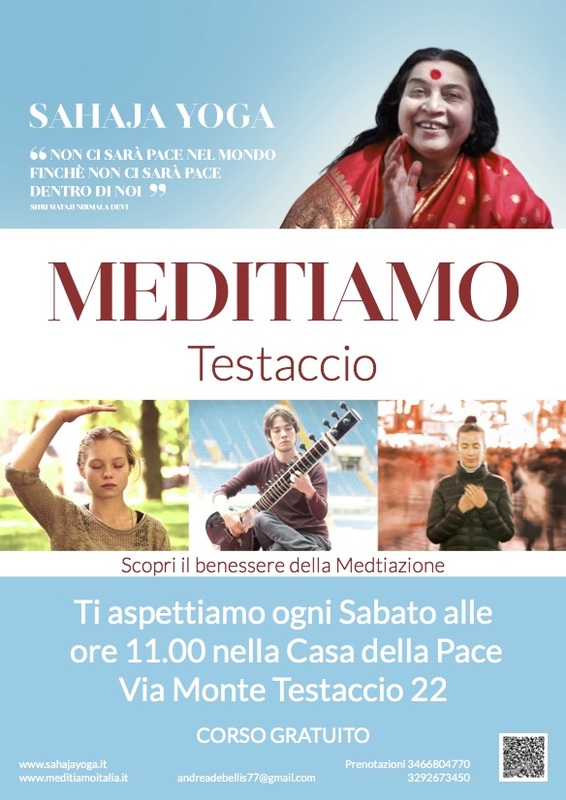 For lovers of meditation, following the event organized at Macro Testaccio, to follow the experience we would like to invite you to the new free weekly Sahaja Yoga course, to be held from Saturday 4 November 2017 and will continue throughout 2017 -2018, every Saturday at the House of Peace, at Monte Testaccio 22 at 11 am (Adjacent to Macro). The Sahaja Yoga course is open to all people interested in experiencing the benefits that meditation can give to our emotional, physical and mental state, helping us eliminate stress and increase our ability to naturally achieve an inner balance. The lesson lasts about 2 hours and consists of techniques that are very simple and accessible to anyone who illustrates the meditation method called Sahaja Yoga. Sahaja Yoga is an innovative method that, although having ancient roots, can admirably synthesize an age-old knowledge by providing easy-to-learn techniques that allow immediate practical application in everyday life. The word “Sahaja” means in fact spontaneous and “Yoga” means union. Sahaja Yoga therefore invokes the possibility of achieving a state of inner peace, of completeness and harmony with all living beings, through a simple process, out of complex mental theories of difficult understanding; a clear pathway to everyone’s reach, which quickly leads to benefits that can be found objectively since the first meditation. Importantissima iniziativa a cui desidero partecipare.